I stopped counting days long ago. 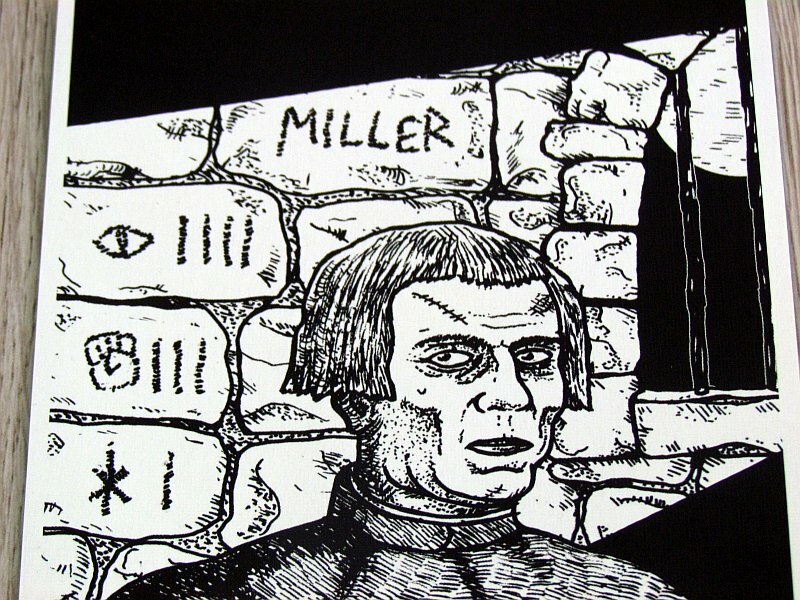 I was calmly drinking beer in the tavern and I did not pay attention to steps approaching me from behind. I still have a scar on my head from that blow. And then I woke up in the dark. When you find yourself captive, at first you have a lot of strength and you are trying to figure out the chances of getting out of your prison. After a few days, your senses will start to get numb and everything falls under a hazy veil. After a month, you just sit and wait for your destiny to come. As a result, I did not even notice immediately, that the doors of my cell were open. I stumbled into the corridor and began my fight for escape. 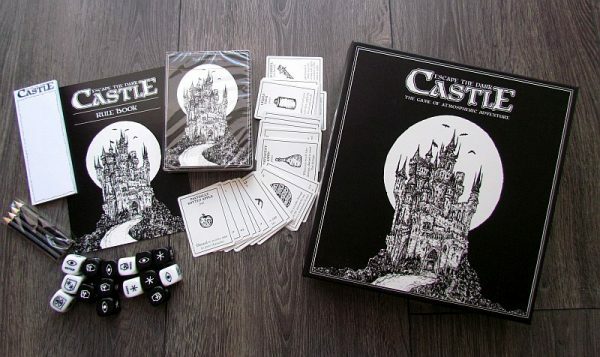 And so will the players, if they decide to delve into the world of Escape the Dark Castle board game, created by three designers Thomas Pike, Alex Crispin and James Shelton. 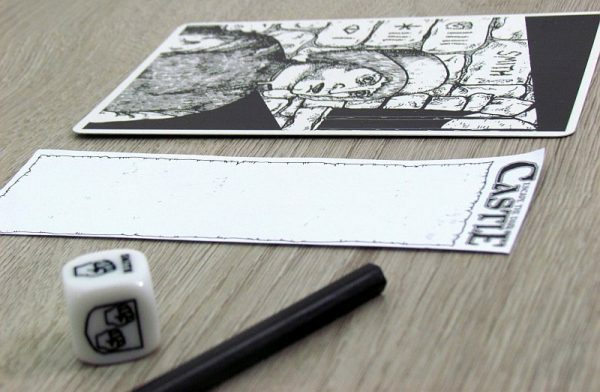 The whole game was released by Themeborne, primarily thanks to Kickstarter fans. 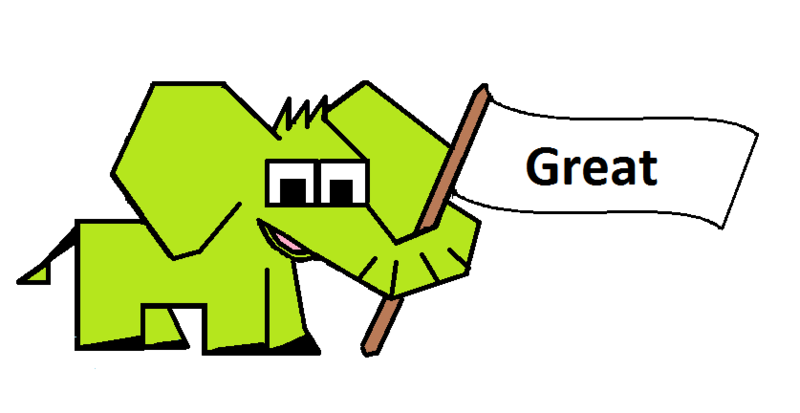 Its successful campaign ran in May 2017 and attracted more than 2,000 players and their support. 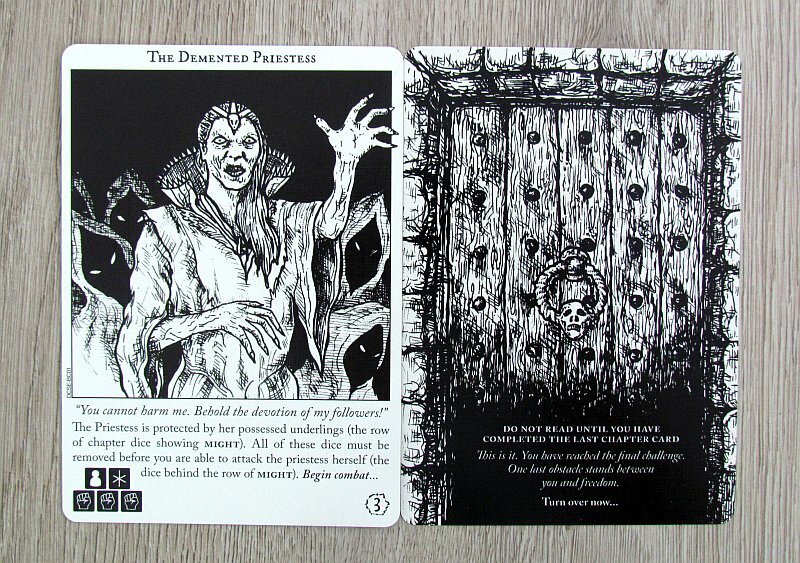 We have now got the final version in hand thanks to Esdevium Games distribution company. Square box itself is dark enough to match the title and pulls you into its horror theme. 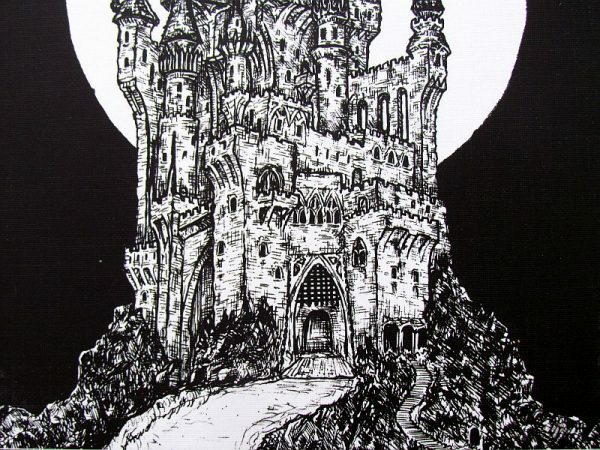 On the lid, in the light of the full moon, you can see a huge castle full of scary chambers. Players will discover it through a big chapter cards, each one belonging to one chambeer, always with some atmospheric text and some numeric informations about its dangerousness. 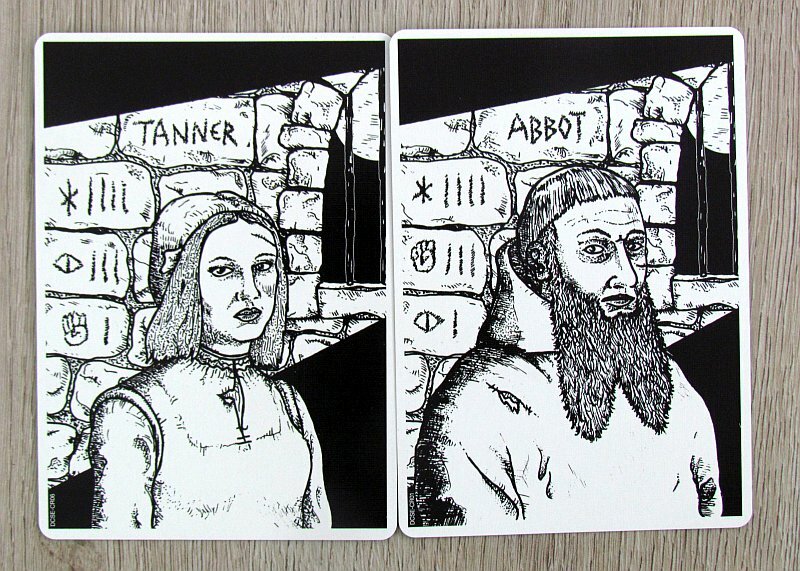 Of course, there has to be an illustration on each card, that is tuned to spirit of the game – created in black and white. As part of the preparation, players will take fifteen random card from this exploration deck, add one of three bosses to its bottom. 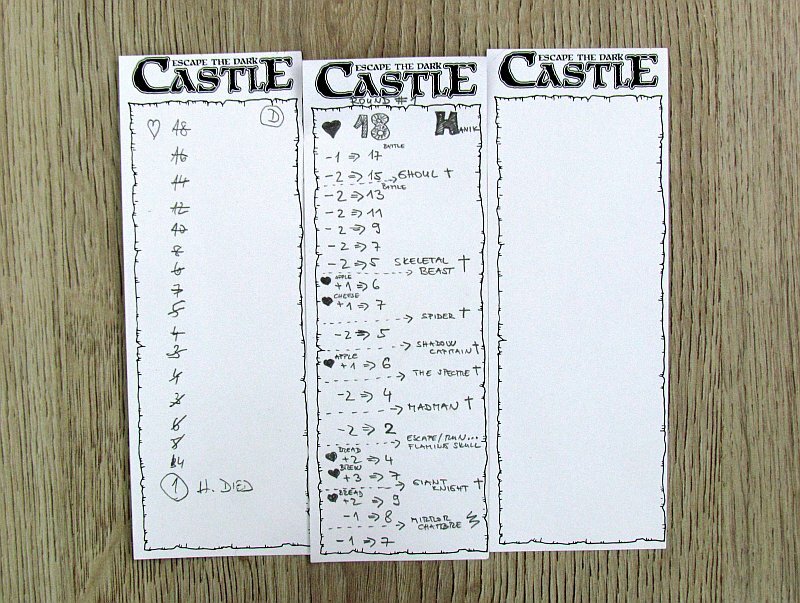 That means, they have prepared their own castle package. 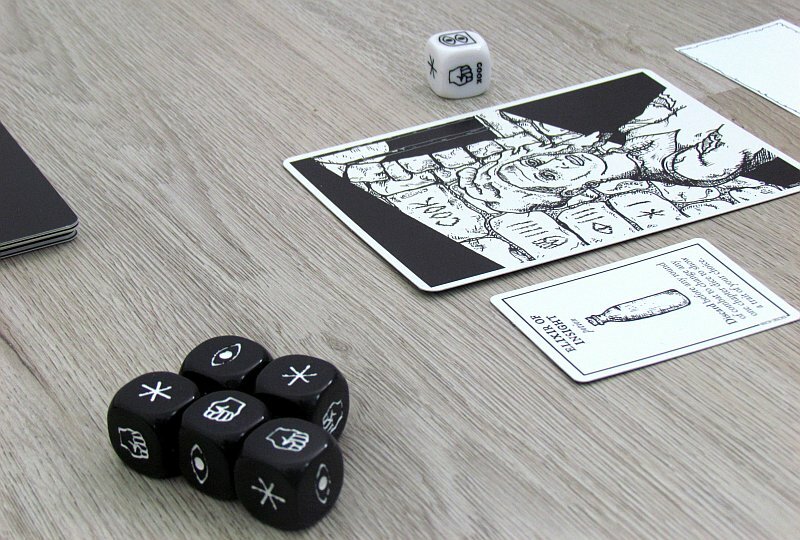 Another six cards in the box represent heroes of the adventure and their style is carved into stones behind their character – it shows layout of the icons on hexagonal dice. Every hero has his own dice and player takes it for himself as soon as he chooses character. 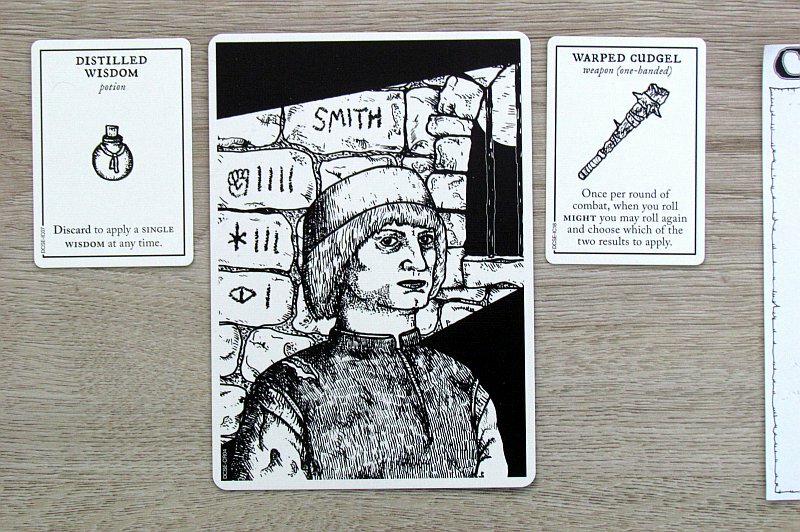 In addition to these, player will also receive a pencil and a sheet of paper to mark his starting value – number of lives. All of this is included in the box and you do not have to go into your own stock of papers. A set of black episode dice must be placed in reach together with a deck of small item cards. Game is not divided into any turns according to participants. 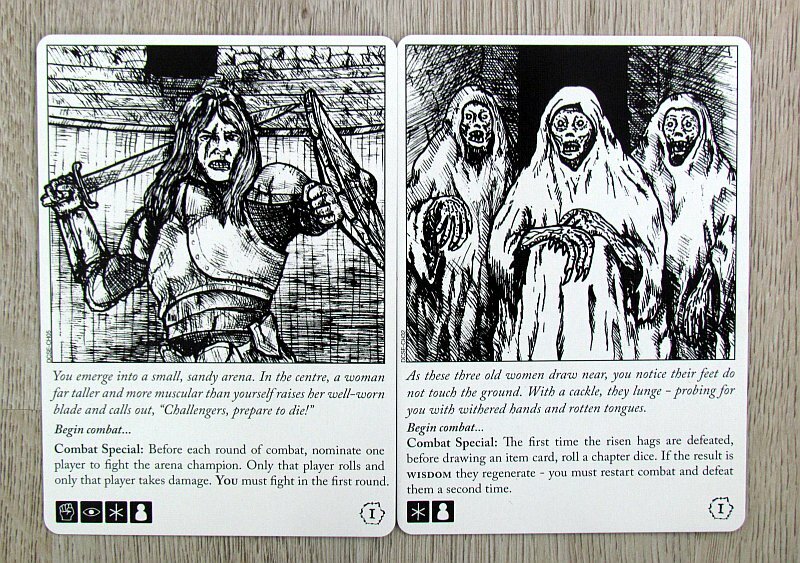 Instead, player simply choose one of them to explore the chamber first and therefore is responsible for turning top card from chapter deck. This is because some of the effects of a newly visited room may be specific to the one, who enters it first. 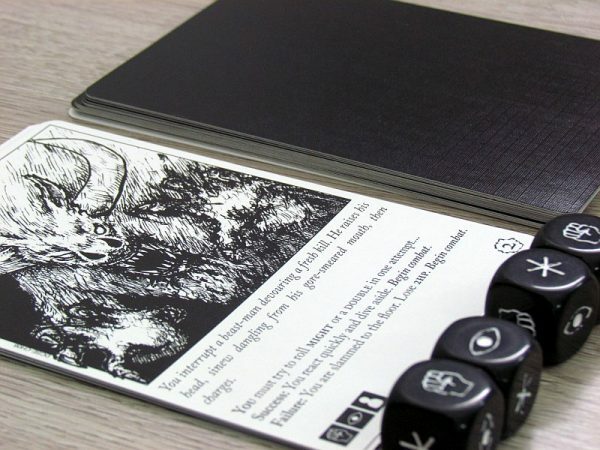 Players then listen to text on the card. First, explorer should read text in italics, that sets up whole atmosphere and situation in the room. Then players often get to choose as a team, sometimes they can even run away, other times they have to fight. 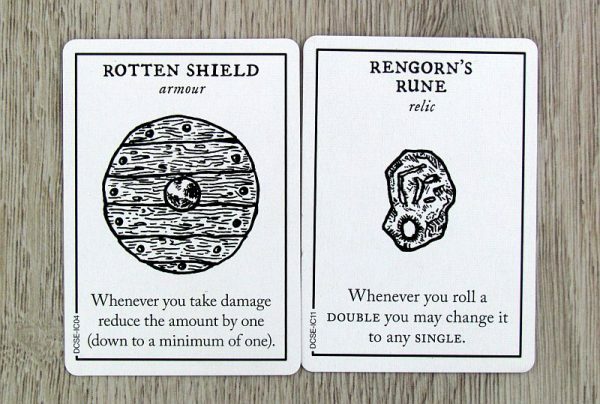 Each enemy’s card has several symbols at the bottom and players will set story dice beneath it accordingly with these icons up. But there can be also one icon more with player silhoutte – that means, that one dice for every participant should be rolled in addition and raise strength of the creature. 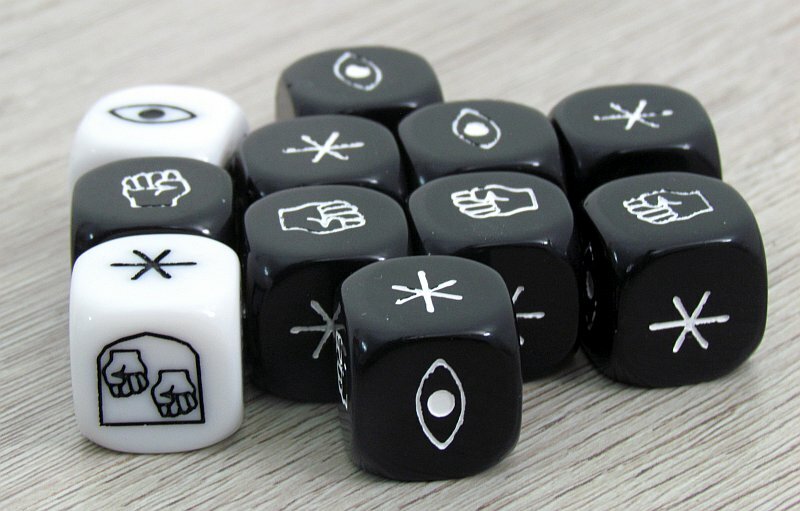 All the heroes then roll their own dice and try to match icons on dice in the middle. 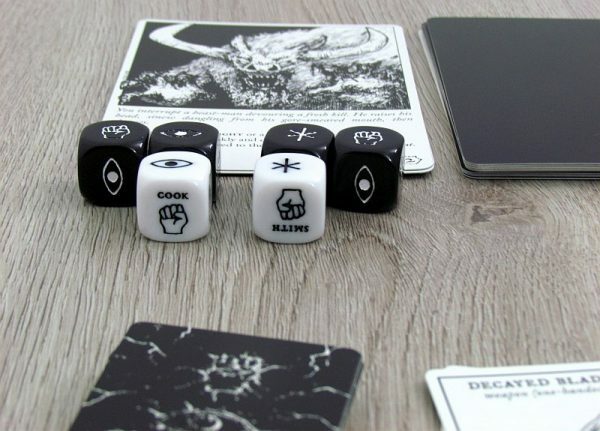 But if the monster is still standing after using all of the heroic (white) dice, it gets a chance to take revenge avenge on the attackers. 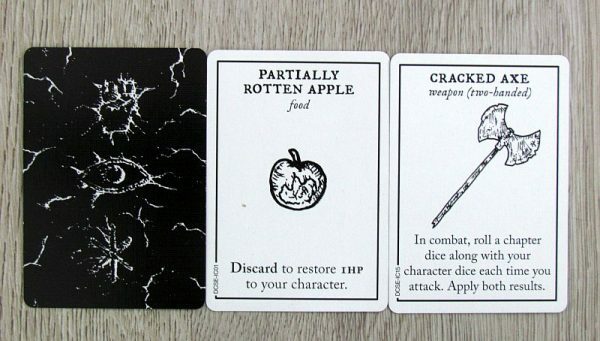 Players must then lower number of their lives according to strength of the attacker, which is printed on the opponent’s card in the bottom right corner. For each defeated opponent, players can draw one random item card from top of the deck. 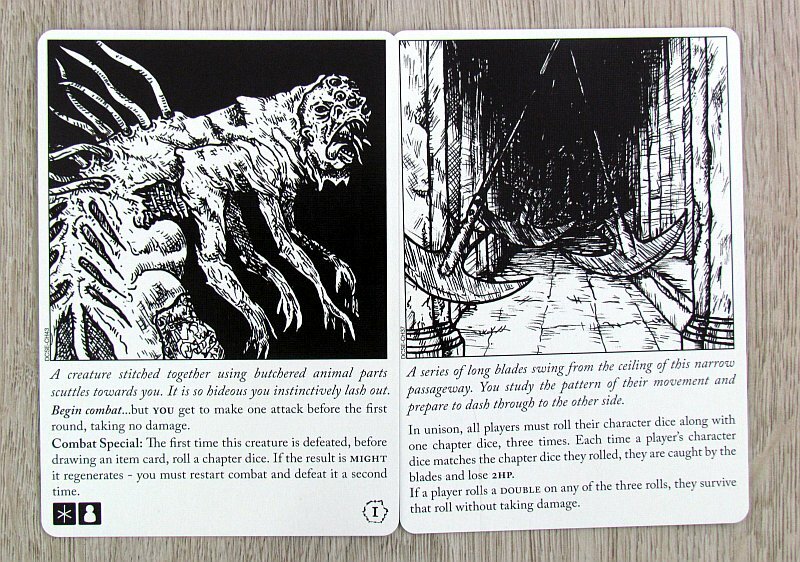 And so the players roam through the series of chambers and encounter monsters. 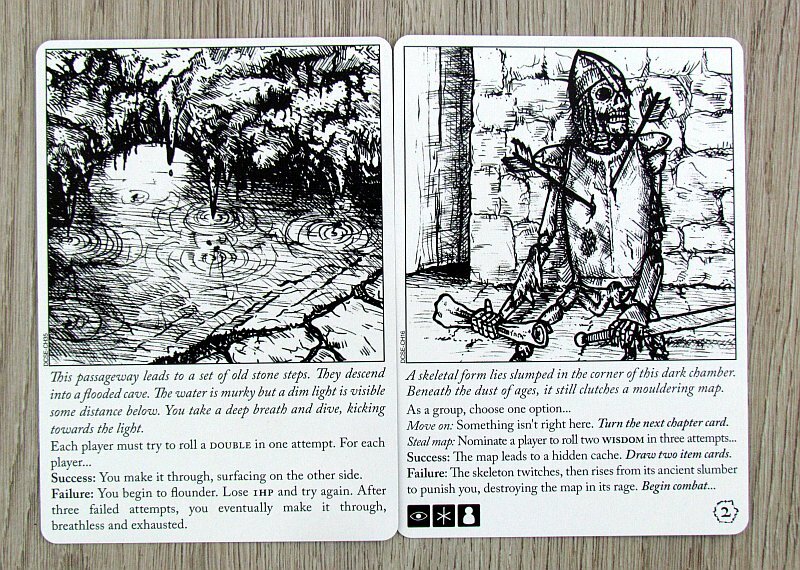 They have to overcome all the pitfalls, in which they get help from cards of objects. But once one of the heroes has lost his last point of life, whole team has failed. On the other hand, when the group of heroes defeats the final boss and survives, they all can celebrate victory and a successful escape. Escape the Dark Castle is a card game for true adventurers. Players travel through the house of horror together as a team, but yet one of them will have to take on the risk of exploration every time they advance. Dividing the danger from entering the room and delegating it to the right hero at the right moment is the basis of success or defeat. 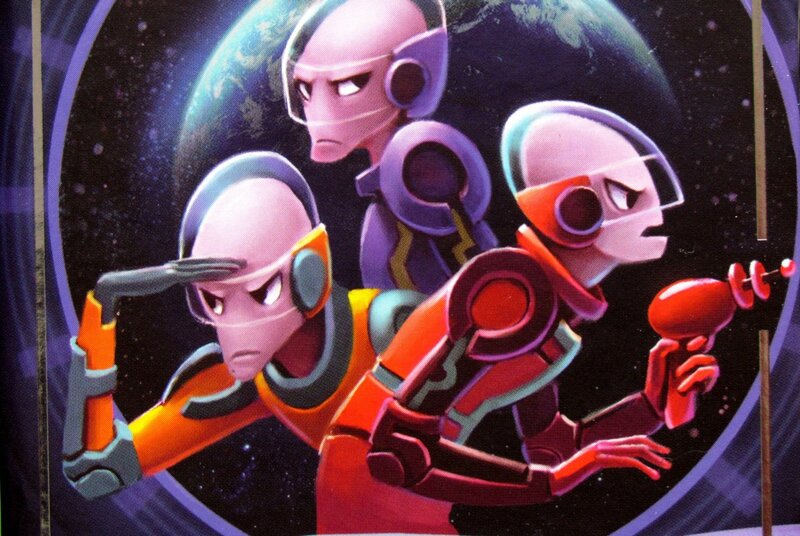 The character often gets more injuries in addition to the group, so it’s not a good idea to push into door hero, who is on the brink of death. Entire passage through rooms is full of horrific encounters and dense atmosphere. But the players absolutely need to be lucky in rolling dice to be successful. The correct choice of character at the beginning of the game is really important, because group of refugees should be balanced. That’s how they maximize their chances of successful escape. 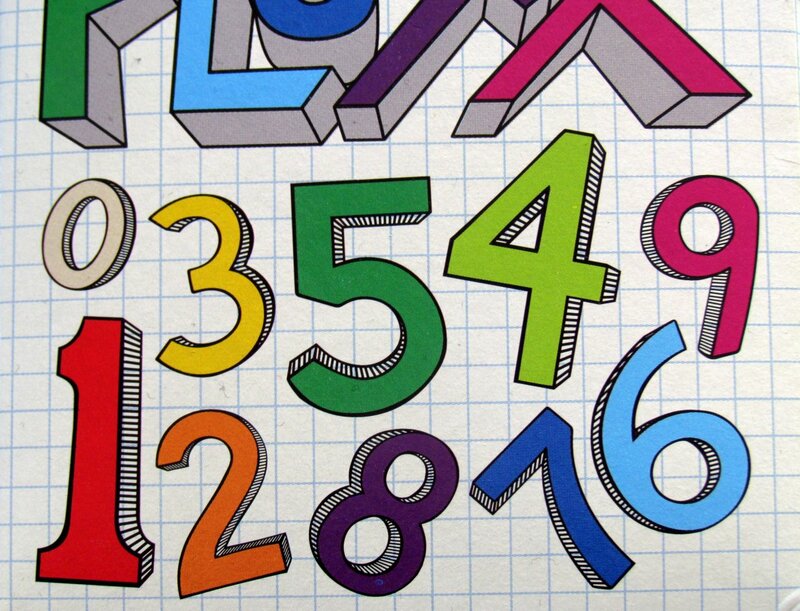 But even if the cubes have a better ratio for the symbol, it’s still about luck. And player needs to be lucky also if he wants to avoid retaliation. For that, he needs to roll a shield symbol, that is only on two (double) sides of every dice. 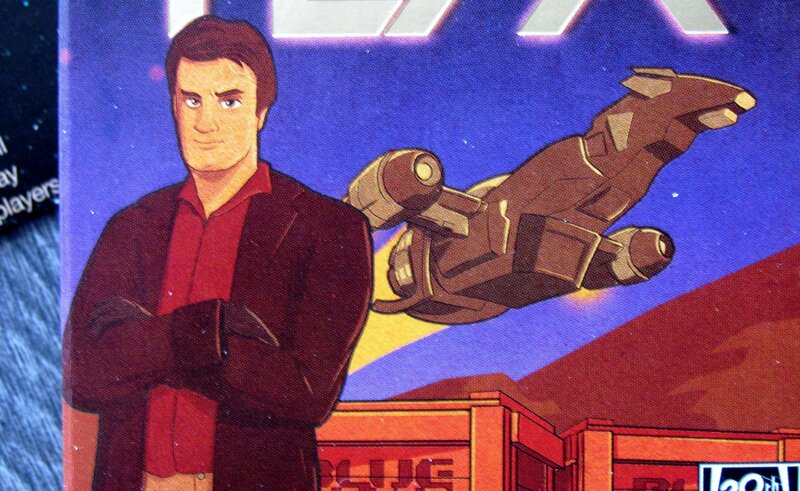 Given the luck involved, it is understandable that the game lacks some true depth. But it is replaced by atmosphere, and above all by real simplicity. 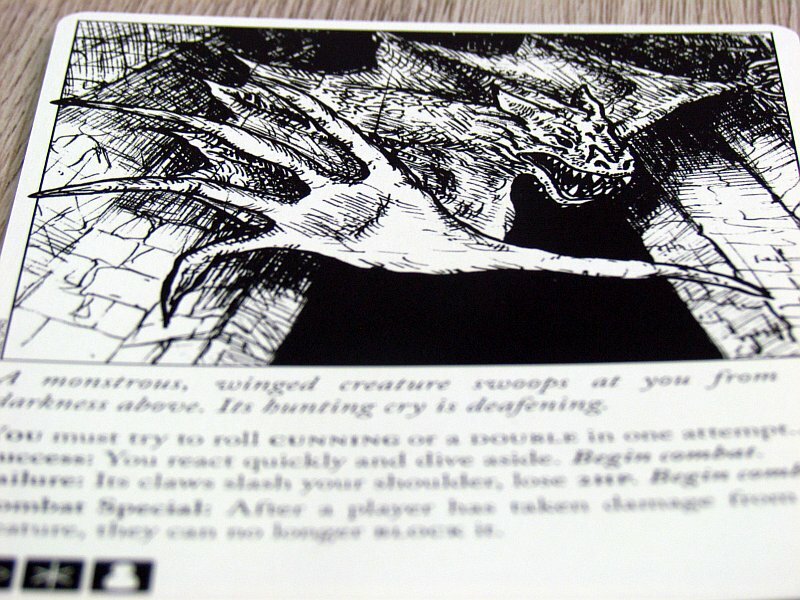 The game is designed to be as accessible as possible, but does not spoil experience in doing so. And that surprisingly thrives, as players try to enjoy a lot of exciting moments in common effort. They will be very keen to remember the individual escapes filled with interesting moments. There is plenty of cards. Well, there are only three bosses, but you only use a third of chamber cards in a game. And because their order is always random, uniqueness of individual matches is guaranteed. Even after ten games, you can easily encounter a room, you have not visited yet. 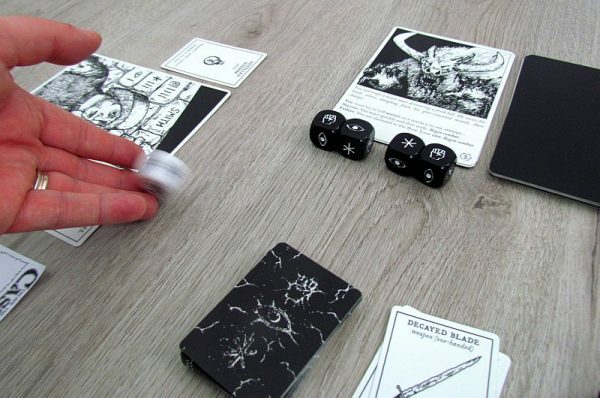 But that does not apply to the item cards – there is fewer of those and players are able to easily pass through the whole deck even in one game. Match is perfectly balanced for different numbers of players. Enemies will get more dice, if more heroes stand in their way. But ultimately, the difficulty of the game is determined by completely different elements – it is easy to meet one stronger monster, miss the chance to escape and spend more time, energy and precious lives while battling with it. Suddenly, supply of heart begins to diminish considerably. Game can also be played in solitaire mode, and it’s great! And game times are awesome as well. 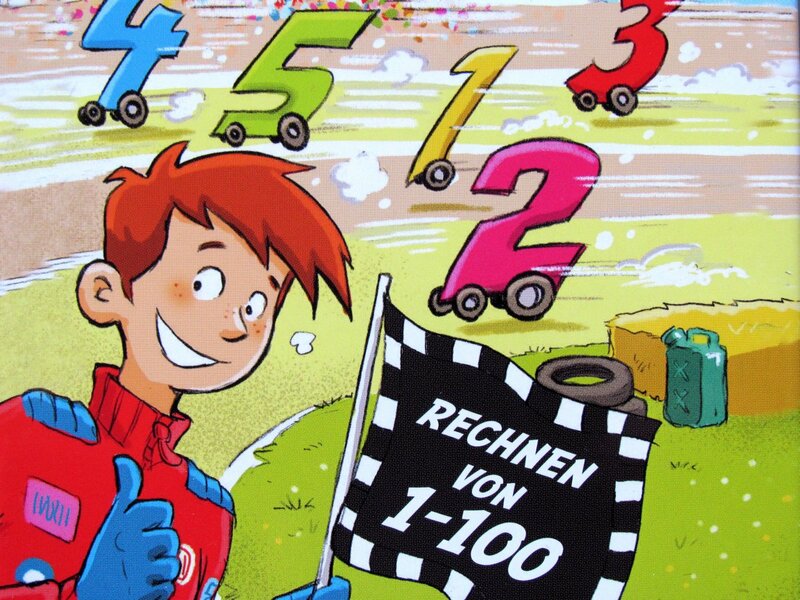 The preparation lasts only that much time as you need to pick the character, and even in the case of successful walkthrough, it is a matter of thirty minutes to finish. We are most fond of true black and white processing for the whole experience. This distinguishes the entire box and its content from the competition. Everything is beautifully tuned, the illustrations are great (huge cards really stand out) and overall impression works fine as well. 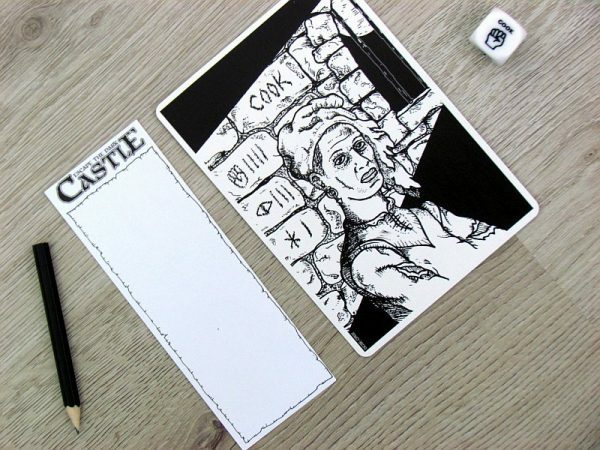 Escape the Dark Castle is a cooperative card, that definitely has its charm. This is especially true in simplicity. 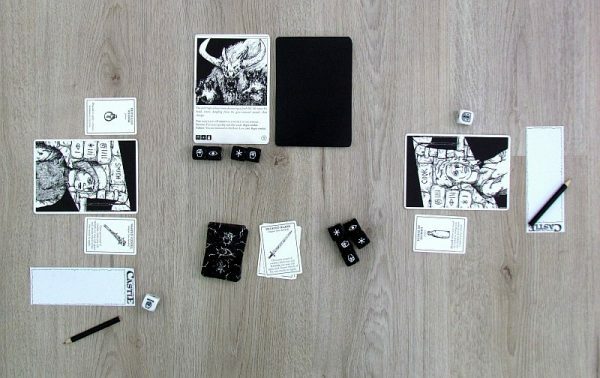 But an important element is also atmosphere, that gives players the chance to experience the strain of getting defeated by monster-filled castle. 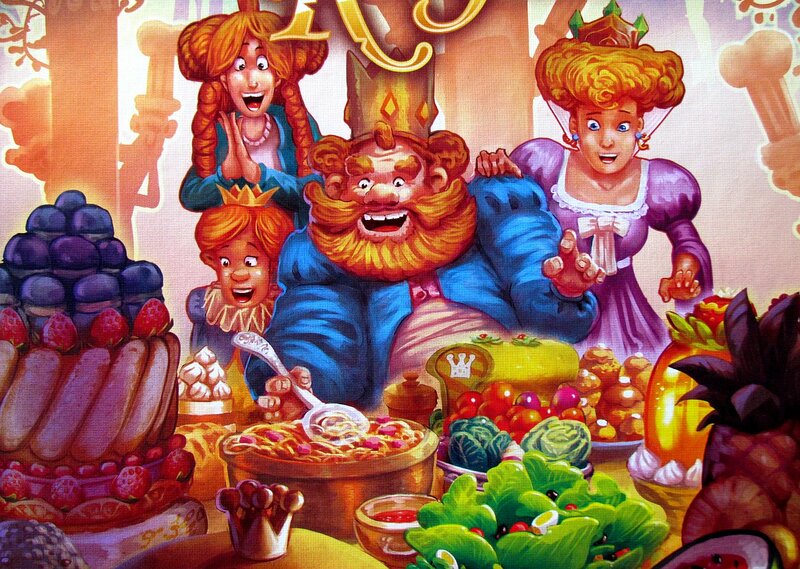 The game is well suited for beginners, but holds enough challenges even for the more experienced. Escape the Dark Castle can reach to all lovers of cooperation (and hopelessness). 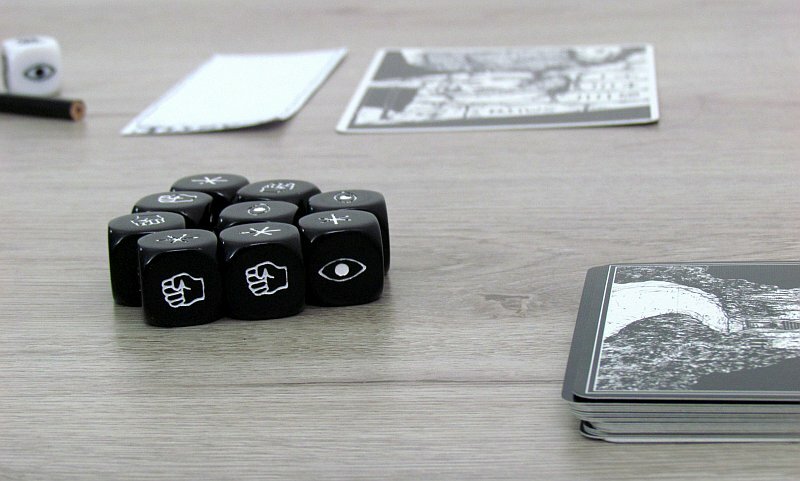 Escape the Dark Castle is a game, that offers a dense experience. But players often can feel hopeless, because this game is not easy. In addition to a good balance of characters and good tactics, players need a good bit of luck. 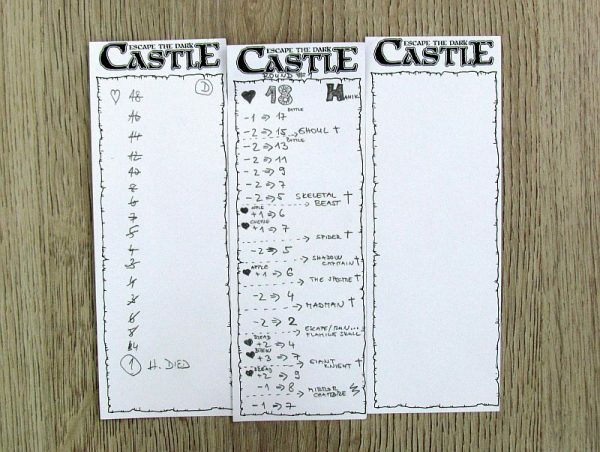 And because the game is simple and fast (half hour time), we have grown to love Escape the Dark Castle and we recommend it to those, who like some challenge and do not need to compete with each other.